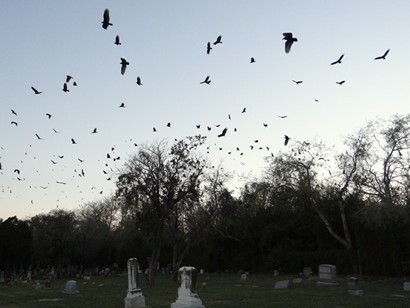 We Texans are raised knowing when several buzzards are circling in the sky it marks the spot where there is something dead. 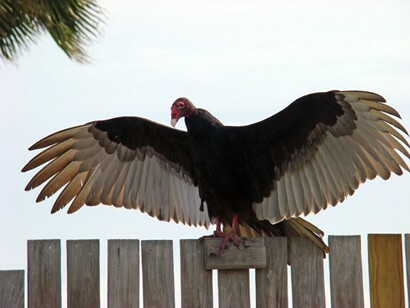 Buzzards eat carrion, dead and decaying critters and animals. Until a buzzard picks up some scent or sight of food they simply are a lone bird sailing in the sky riding thermal air lift. When road kill is found many buzzards will land and then a eating pecking order is established. I don't understand how that pecking order is decided, it is just a fact. At age 6 I remember using my uncles' 22 short Remington rifle to shoot at buzzards circling overhead. I only remember hitting one once. I hit the feathers of one wing with a thud. That wing lifted a little but the buzzard just kept circling. We just returned from the Rio Grande Valley where we found a buzzard roost near Weslaco Cemetery. Of all the buzzards I have seen - I had never seen their roost. While looking for roosting parrots we found a buzzard roost instead. These buzzards chose to roost in trees along side a human cemetery. All this buzzard commotion was done in silence contrary to parrots whose roosting method is very loud. This roost photo was made after something spooked the group during sundown.